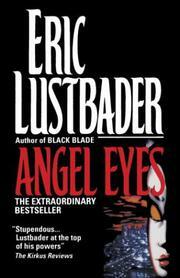 Lustbader at the top of his powers, a poetic karate chopper with a smashing autumnal finish, by the author of The Ninja, French Kiss, etc. This time out, Lustbader dims the gratuitous gore (still plenty but not so much), cuts back on outlandish action, and reigns in his subplots with a firmer hand. Grieving Tori Nunn--a Wild Child picked off the Tokyo streets by Bernard Godwin, head of a supersecret US intelligence agency called the Mall, and turned into its top agent because of her closeness to the Yakusa criminal gangs of Japan--resigns from the agency when her brother Greg dies in outer space on a joint Russian/American space shot. Actually, however, Greg lived and his fellow Russian cosmonaut died. But Greg had contact with something extraterrestrial and has been turned into a peace-loving semidolphin with superpowers who has to be kept in a big salt-water pool in a Russian prison. With his big dolphin eyes ("angel eyes"), mind-reader Greg secretly runs an underground group called White Star, which is out to save Gorby from assassination. Meanwhile, Tori is seduced back into the Mall and given top director Russell Slade as her field assistant. Her job: to break the Medellin cartel, which now markets a supercocaine that kills its users in three months or less. The Yakusa are in on this too, and so Toff and Slade first find themselves in Medellin ("Machine-Gun City"), digging their way into the drug-lords' compound, then off to Tokyo and facing out the Yakusa traffickers, and finally to Moscow, where Godwin is fitting out the underground movement with nuclear devices. In the subplot, Toffs zillionaire parents--aging Hollywood star Laura Nunn and her husband Ellis Nunn, Hollywood's greatest lighting genius--are funding Greg's White Star movement and supplying armaments. The climax, suspended over the whole tale, is ToWs meeting with dolphin brother Greg (called "The Hero" by his Russian captors) in his pool. Stupendous trash from a master hand.